My friend Pete invited me to check this place out back in October, but we couldn’t make it work until now. His claim was that Rico’s is better than my favorite burger place (which he quite enjoys, too) – Val’s. Why haven’t I written about Val’s yet? I couldn’t tell you. But this entry is about Rico’s Diner. Rico’s is located in Downtown Oakland, fairly close to Lake Merritt. It’s a little diner amongst a bunch of tall buildings. Kinda cool actually. I let the expert tell me what to do. In this case, it ended up being a cheeseburger, fries, and a peanut butter milkshake. Burger and fries is $8, milkshake is $4.25. $8 is a price I can deal with. But spoiler alert, the peanut butter milkshake is one of the absolute best tasting concoctions I’ve ever had. Being the cheapo that I am, I was concerned when a milkshake was served to me with no refill tin for over four bucks. Internally I was thinking, this better be good. But I knew Pete wouldn’t let me down. And, I had a sip. It was a creamy fresh rich peanut buttery feeling in my mouth that I never wanted to end. Perfect texture, too – no spoon required, yet it felt nice and thick. Yeah, yeah, that’s what she said, I get it. So naturally, you finish the shake pretty quickly. But it’s rich enough where you realize that the portion size is right. The key, as Pete says, is not to drink it too fast, and save some for when your burger comes. Which I kinda succeeded at. So, now for the actual meal. While it’s clear the the shake stole the show, I still enjoyed a very good lunch. My first note, unfortunately, was that the burger was well past the medium I had requested. 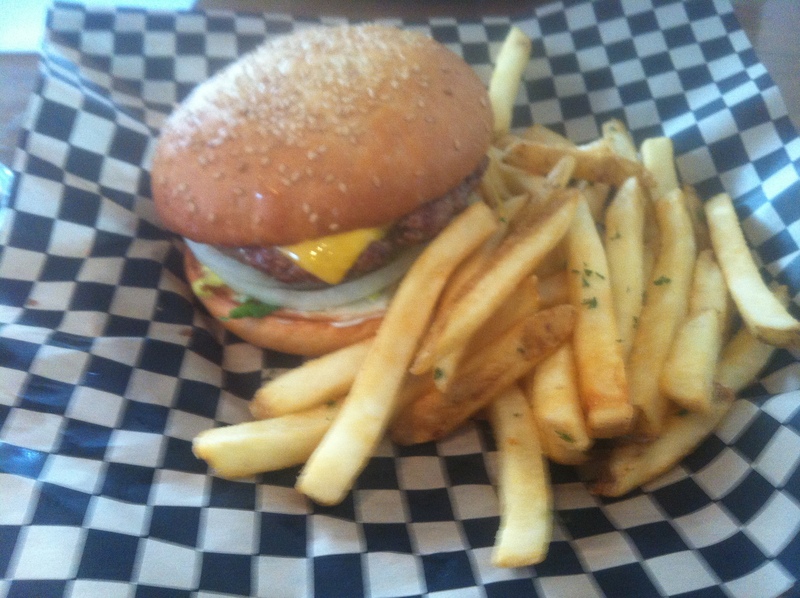 It still had a lot of good taste, but was lacking a the juiciness factor that makes the best burgers the best. If it was at medium, I don’t think it would have had this issue. Now, the burger was served on a good bun, and Pete confirmed afterwards that it was in fact an Acme bun. Auto bonus points for nice buns, am I right? I have to make this review based on the burger I was served, but I bet next time if it’s cooked correctly, I’ll be singing a more positive tune. To finish off the meal, the fries were good, but probably the least memorable part f the meal (pardon me while I daydream about the milkshake some more). May get garlic fries next time. I think Rico’s has an additional vegan menu or something, but in case you missed the memo, this blog does not cater to herbivores. Though I’m sure my good friend Jesse would be thrilled to learn that there is a vegan pulled pork sandwich made with seitan. And when I say thrilled, I mean he’d be frightened. I definitely want to come here again, and suspect I’ll meet Pete for lunch again not too far in the future. Will ask for the burger to be rarer next time, and I bet I’ll walk away even more satisfied. All in all it’s a cool joint, and I recommend it to anybody who is searching for that perfect unpretentious milkshake. Seriously. It was so good.